New anthology with Craig Smith’s translation? While co-blogger Craig Smith’s excellent Inclusive Bible is now only in print in paperback (I am glad that I stocked up with multiple copies of the hardcover), it looks like his work is going to be featured in a new anthology published by Rowman & Littlefield: Three Testaments. From disagreement over an Islamic Center in New York to clashes between Christians and Muslims in Egypt, tension between the three Abrahamic faiths often runs high. Yet for all their differences, these three traditions—Judaism, Islam, and Christianity—share much in common. 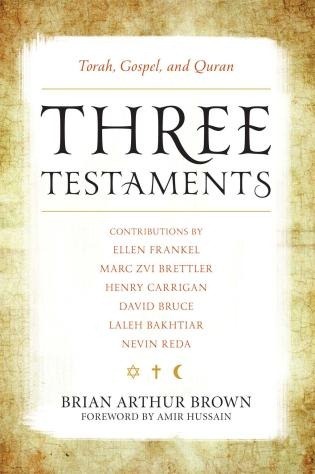 Three Testaments brings together for the first time the text of the Torah, the New Testament, and the Quran, so that readers can explore for themselves the connections, as well as the points of departure, between the three faiths. Notable religion scholars provide accessible introductions to each tradition, and commentary from editor Brian Arthur Brown explores how the three faiths may draw similarities from the ancient Zoroastrian tradition. This powerful book provides a much-needed interfaith perspective on key sacred texts. Three Testaments is appropriately inclusive in many ways. The use of inclusive scripture is especially appropriate for the twenty-first century, both scholarly and evocative. To leave women out of the scripture in our time would be to distort the message entirely. Three Testaments: Torah, Gospel and Quran invites readers to study the interdependence of the Scriptures claiming the tradition of Abraham, Sarah and Hagar as their heritage. I especially appreciate the use of inclusive language and the voice of wo/men scholars in part I and III introducing the progressive edge of Jewish and Muslim Scriptures. This volume is a very unique and helpful resource for introductory Scripture courses and interreligious dialogue. I highly recommend it. Huh. I had no idea. Very cool. By the way, Joan Chittister was a friend of the Inclusive Bible from its earliest days, when we were just doing inclusive language versions of the daily and Sunday lectionary readings. Terrific person. Congrats, Craig. Many more readers, and hopefully royalties too, to you!